Experience the terrifying international bestseller! 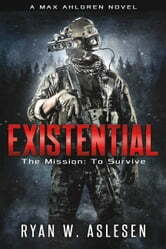 The Alaskan wilderness holds a nightmarish secret that threatens all of humanity in this epic sci-fi horror thriller. Looking for a blockbuster thriller that combines explosive sci-fi action with intense horror that will have you gripping the page with fear? Then look no further and standby for a roller coaster ride of terror. It was supposed to be just another mission... Buried deep in the rugged Alaskan wilderness lies a secret that could alter the future of mankind--a secret that billionaire Elizabeth Grey has invested millions in solving. But when the dig goes silent and all attempts at making contact fail, an elite team of battle hardened military contractors is brought in led by former Marine Max Ahlgren, a warrior haunted by his past. While the mission to make contact and rescue a team of scientists and engineers working on an "archaeological" project seems like an easy payday, once on the ground, the team discovers the grizzly truth that this is no ordinary rescue. Max and his men find themselves in the fight of their lives against a nightmarish enemy like nothing they have ever seen. In what quickly becomes a struggle for survival, the world's greatest soldiers will encounter the universe's ultimate terror in a battle that puts all of humanity at stake. No Backup. No Escape. No Hope. Existential will take you on an epic journey that will leave your heart pounding with every page. Keeping in the tradition of Michael Crichton, Stephen King, and John W. Campbell, Existential is the perfect combination of science fiction, explosive action, and intense horror. Terrifying, visceral, and deeply moving, Existential is a novel that will haunt you forever. Pick up your copy and get in the fight today! Warning: This book contains intense scenes of violence and horror. It isn't for the faint of heart. Reader discretion is advised. This was an interesting read, sort of a mash up of "The Thing" and "Predator." It has lots of action and a real page turner, not knowing what to expect from this special team. This is a pretty weak effort by the author. Very much styled after Tom Clancy's technique but missing Clancy's skill at character development. So this might appeal to military enthusiasts. The sci fi aspect is badly conceived - the UFO is almost human-made, making it easy for the heroes to get around. The monsters are at first interesting and later, mass produced. The ending is anti-climactic. I had high expectations for this book, as I like mystery/horror stories based in arctic conditions. The premise was good, but it fell short of being excellent because: 1. It could have used better proofreading: "unphased" when "unfazed" would have been correct, for example. 2. The ever-evolving "monster" was morphing into way too many forms to be credible, even given the license that we must give to speculative fiction. 3. The characters were too formulaic, and not in themselves very interesting, and their dialogue didn't seem very lifelike. A good attempt, but I didn't find it satisfying in the end.